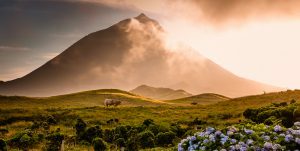 Experience the unique characteristics of Faial, Pico and São Miguel in one week, with a small private group of no more than 8 people. Please call for the single supplement price. Rates are subject to hotel availability and are only guaranteed when paid in full. Upon arrival on the island of Faial, a representative will meet you and bring you to your hotel. The rest of the day is free to relax and explore the city of Horta made famous for it's marina. You begin your full day tour to discover the island of Faial by driving through the city of Horta. Horta is most famous for its cosmopolitan yacht harbor. You next stop at the scenic point of Espalamaca to view the harbor and all its surroundings, followed by a visit to the Caldeira. The Caldeira is a large crater in the central part of the island, where you view the beautiful landscape and natural protected area. Your tour finishes at the Capelinhos volcano, where the volcano last erupted in 1958. (The museum entrance optional). Today you will take a ferry to Pico. Your full day tour of the “Mountain Island” begins at the Arcos do Cachorro, an impressive display of rock formations (one in the shape of a dog), coming out of the sea. You drive towards Sao Roque do Pico, where you will stop to visit the beautiful town by the sea. You then head on the inner roads heading south on the island. Lunch will be served at a local restaurant as the tour proceeds around the island. On your way back you will stop at a handicraft exhibition, cheese factory, and wine cellar, evening departure to Horta Faial by ferry. Upon arrival you will be brought back to your hotel. Today you will say goodbye to Horta and hello to Ponta Delgada. After breakfast, you will be transferred to the airport from your hotel. Upon arrival in Ponta Delgada, a representative will be there to bring you to your hotel. 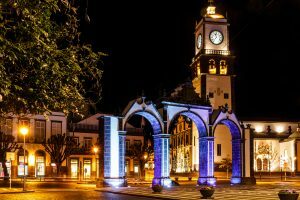 The rest of the afternoon is on your own to discover the biggest city in the Azores, Ponta Delgada. Or consider taking in a whale watching tour or a half day hike on one of the islands many trails. Today you will be off on a full day tour, to the eastern side of Sao Miguel. We begin by heading north to the city of Ribeira Grande, where we will visit a city with rich history and culture. You continue to the view point of Santa Iria, before arriving in Porto Formoso to a tea platation. At the tea plantation you will get to see the process of how the tea is cultivated, and prepared, as well as sampling the teas. We arrive in the Furnas Valley, but first stopping at the the Pico de Vara to get an overhead look of the lake and the town. 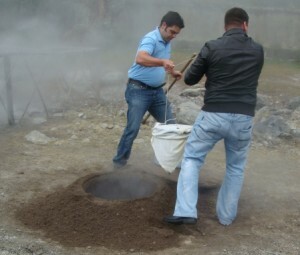 We make a stop at the lake to see our lunch being pulled from the geothermic oven, before stopping for lunch. Lunch will be served in Furnas (Cozido). After lunch you will have time to visit the town. We return to Ponta Delgada via the southern road, stopping at view points in Vila Franca do Campo, before arriving back at the hotel. Your last day in the Azores, is at your leisure. 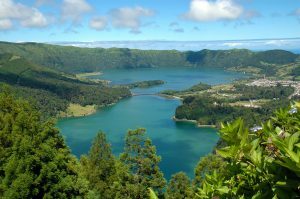 Consider taking a full day tour of Sete Cidades and Lagoa do Fogo, two beautiful caldera's on the island or going on adventure with hiking or canyoning, as the island has many nature playgrounds. On your final morning in the Azores, you will have time to do any last minute shopping, or just relax. Before being transported back for your return flight home. CALL 1-888-678-9093 TO BOOK YOUR TRIP NOW! Located in Fall River, Massachusetts. Tour Azores provides escorted and self guided tours of the Azores, Madeira and Mainland Portugal.